The small smattering of bright blue stars in the upper left of this vast new 615 megapixel ESO image is the perfect cosmic laboratory in which to study the life and death of stars. Known as Messier 18 this star cluster contains stars that formed together from the same massive cloud of gas and dust. 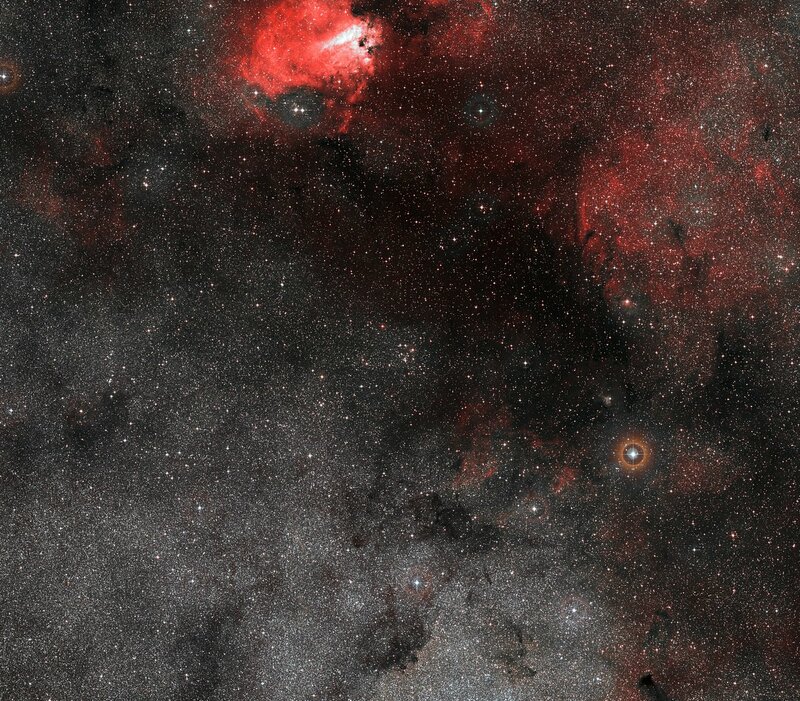 This image, which also features red clouds of glowing hydrogen and dark filaments of dust, was captured by the VLT Survey Telescope (VST) located at ESO’s Paranal Observatory in Chile. Messier 18 was discovered and catalogued in 1764 by Charles Messier — for whom the Messier Objects are named — during his search for comet-like objects . It lies within the Milky Way, approximately 4600 light-years away in the constellation of Sagittarius, and consists of many sibling stars loosely bound together in what is known as an open cluster. In Messier 18 the blue and white colours of the stellar population indicate that the cluster’s stars are very young, probably only around 30 million years old. Being siblings means that any differences between the stars will only be due to their masses, and not their distance from Earth or the composition of the material they formed from. This makes clusters very useful in refining theories of star formation and evolution. Astronomers now know that most stars do form in groups, forged from the same cloud of gas that collapsed in on itself due to the attractive force of gravity. The cloud of leftover gas and dust — or molecular cloud — that envelops the new stars is often blown away by their strong stellar winds, weakening the gravitational shackles that bind them. Over time, loosely bound stellar siblings like those pictured here will often go their separate ways as interactions with other neighbouring stars or massive gas clouds nudge, or pull, the stars apart. 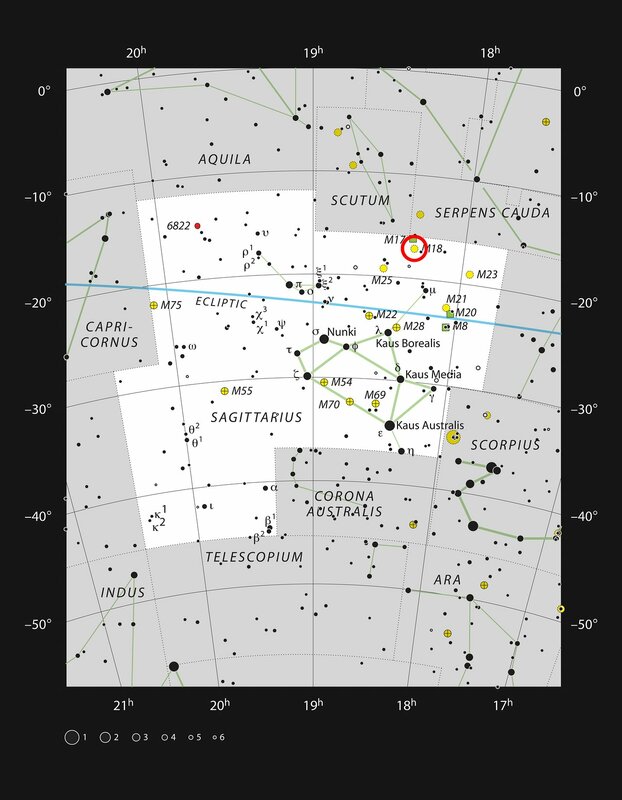 Our own star, the Sun, was most likely once part of a cluster very much like Messier 18 until its companions were gradually distributed across the Milky Way. The dark lanes that snake through this image are murky filaments of cosmic dust, blocking out the light from distant stars. 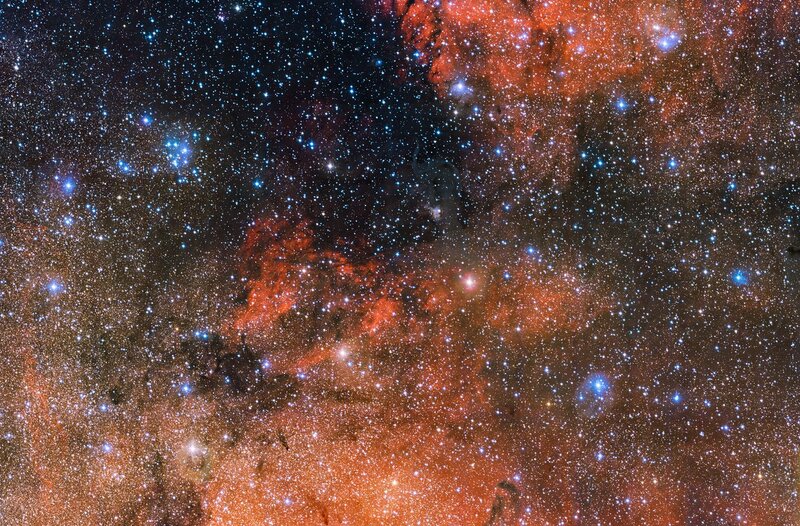 The contrasting faint reddish clouds that seem to weave between the stars are composed of ionised hydrogen gas. The gas glows because young, extremely hot stars like these are emitting intense ultraviolet light which strips the surrounding gas of its electrons and causes it to emit the faint glow seen in this image. Given the right conditions, this material could one day collapse in on itself and provide the Milky Way with yet another brood of stars — a star formation process that may continue indefinitely (eso1535). 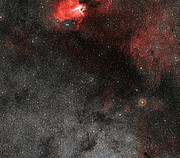 This mammoth 30 577 x 20 108 pixel image was captured using the OmegaCAM camera, which is attached to the VLT Survey Telescope (VST) at ESO’s Paranal Observatory in Chile. 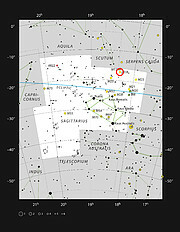 Messier 18 is also listed in the New General Catalogue as NGC 6613.